..... they did a wonderful job on my piano, and they're such nice boys, too! "I am happy to report how pleased I am with my newly restored action featuring the Stanwood system which you recently completed. It is a really sensational and sensitive action now, with wonderful and accurate control in all dynamic ranges. It repeats beautifully and is really comfortable. I was also thrilled to receive the action back so promptly, because I was heading into the busiest three months of practicing in the last ten years! "Mr. Callahan's restoration of our piano had a very special meaning because it was a piano that was a part of my family history. I had never really imagined that it could look so good and that it could sound so magnificent. In visiting his studio, I was impressed not only with his knowledge but his enthusiasm for what he does so beautifully. His work is not only skillful; it is deeply artistic and committed. "Our restored piano is really one of our most prized possessions now. I think there might be a little competition between our sailboat and our piano. I'm afraid for me it's the latter! It had always been a dream to restore my father's piano, and I had postponed it as I thought it was such an enormous undertaking. Somehow, John made it seem easy. The piano somehow found its way to his studio, was totally rebuilt and refinished and made it back to our house, via the home of one of the Bay area's most talented composers, Jake Heggie who composed much of his acclaimed "Dead Man Walking" and many of his songs on this instrument. What a blessing." "About the best there is anywhere in the world. I feel that our piano is actually better looked after than we are with Mr. Callahan's attentive service! Thank you Callahan Piano!" "Thank you for making me so welcome in your very special 'atelier' once again. The seriousness and rigor of you and your colleagues never cease to amaze me, and the passion behind your craftsmanship is something rare to behold. And thank goodness there's also a wonderful spirit of fun in your workshop." read more. "Just a fabulous experience from beginning to end--a professional, knowledgeable, and caring staff who delivered what will certainly become a family heirloom. "It was a pure delight to work with the Callahan outfit--I only wish all businesses worked according to the same standards! They turned a decrepit, practically abandoned Steinway into a work of art. We were so fortunate to have placed our piano into the hands of Callahan Piano. "The people at Callahan are true craftspeople--it was a joy to visit the shop and listen to the effusive descriptions of the process for turning an instrument into a masterpiece "Finally, I can use the cliché: 'you get what you pay for!' We are thrilled with our piano!" "My brand new Sauter baby grand had booming sound but the action was a bit heavy and uneven. It didn't need any new parts so John and his crew weighed everything and then added and subtracted weight with excellent precision. They took a fabulous new piano with decent action and made the action absolutely perfect. Playing it now is as smooth as slicing through butter with a hot knife!" "It was a pleasure to have the Callahans undertake the restoration of my beloved family Steinway 1927 M grand piano. It had gradually developed problems of aging and needed a complete redo. I was very nervous about how it would sound when all the work was finished. Imagine my joy when the piano began to sing with the most beautiful rich sonority, with warmth and sparkle. I am so pleased. "Watching Michael as he worked in my home I was astounded by the complexity of the inner workings of the instrument. I so appreciated Michael explaining everything to me and answering all my questions. And yes, his mother is right, he is a VERY nice boy and we had fascinating and enjoyable conversations. He never made any mess either in my formal living room and was always pleasant to have around. But more important was the sense that he was so meticulous and thoroughly knowledgeable in his work and that he really wanted me to be happy with the result, and I am." "I chose Callahan Piano to rebuild my Steinway because it was clear that they understood that this is the most important thing I own. It's like seeking out the best surgeon for an operation... you just don't want to trust it to any old doc. "The service goes way beyond what they did to the piano. John, Steve, Rhys, and Michael patiently explained the process and the care that goes into rebuilding a Steinway. I consider myself an amateur "piano-geek"... these guys are the pros! "After the rebuild, my piano feels so great it makes me want to practice more. Sure, everybody thinks it sounds fabulous, but the way it feels is something that only a player understands." "Before we decided to have Callahan Piano Service restore the action on our Mason & Hamlin, I was very apprehensive. My piano teacher had advised me against it because her past experience with another company had not been favorable. I was even nervous while the job was being done, wondering if the end result would really be an improvement or whether it might be worse. But when the job was completed, it felt like a wonderfully different action and I wondered why we had waited so long to do it! We had made a great decision which was well worth the cost of having it done. "Our Mason & Hamlin had been a good piano over the 35 years or so it had been in my family, but the action was rather "stiff" and not conducive to playing the kind of romantic period music of Chopin, Debussy, etc. that my daughter and I both love to play. Our decision to have Callahan Piano Service replace the existing action in our piano with new, German works was specifically to create a more fluid, easier action that eliminated the necessity of "pushing into the keys.'' Now, playing and blending passages in a piece such as "Jeu d'eau" by Ravel is much more effortless than before and therefore so much more pleasurable. 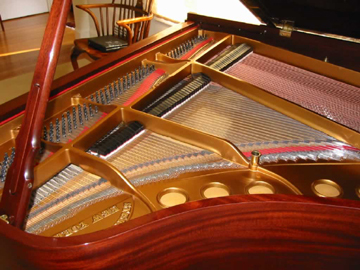 "We couldn't be happier with the quality of service we experienced with Callahan Piano Service. They were extremely attuned to what we were looking for in our action restoration and delivered exactly what they said they would. Simply put, they do a great job! "The "Renner Retrofit" was a very well-worthwhile venture and John did a terrific job of rejuvenating the action with better-than-original parts. The action is much faster with at least 2-4 lbs. less pressure needed to play. Of course, by the time Michael finished voicing it, it was a brand new instrument! Thanks guys... great job! Baldwin 7 ft. grand piano, Callahan was the first piano service company that came to mind. For years our church has relied on the dependability and quality service of Callahan piano technicians for all our piano tuning, appraisals and advice. The completed rebuild of our Baldwin piano gave us literally a new piano with a smoother action and a tone color even richer than before, yet never losing the classic integrity of the original instrument. We are more than satisfied - we're elated!" 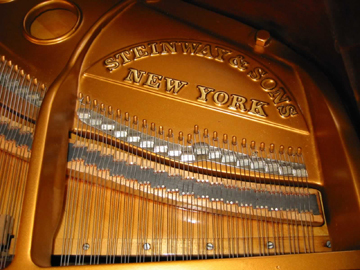 "John Callahan and his team did a beautiful job restoring our 1920 Steinway Model O Grand. It was extremely important that the work be top-flight as the instrument has been in our family since 1920 when James Oliver Curwood, a famous conservationist and novelist, purchased it for his daughter, my grandmother. Deniz and I are both professional composers and pianists. Callahan Piano restored everythinh - even a new keyset with new ivory keytops. We were stunned with the quality - the beauty and playability of the instrument well exceeded our greatest hopes. It is now a spectacular instrument thanks to John and his expert team! "John Callahan and his team completed a full action restoration of my 1929 Steinway Model B, including a new keyset with new ivory keys. As a result of this restoration, I now consider my piano to be one of the finest in the Bay Area. Several concert pianists have played the piano and all commented that they loved the piano's tone, action, and responsiveness. "The action restoration was a major project lasting three months and costing nearly $20,000.00. I feel this investment was a good one compared to the choice of buying a new Steinway which may be of greater cost and lesser quality. The extent of the restoration was well worth the cost. "The quality of service provided by John Callahan and his brothers is outstanding. John wrote a very clear contract and arranged a payment plan spanning the length of the project which was very professional, reasonable and fair. John kept me up to date on the progress of my restoration and completed the project in a timely manner. "The way the piano feels and sounds now as compared to before this work was done is like comparing a spinet to a symphony orchestra ... it is beyond compare!" "I have been thrilled with the improvements in touch and sound since the Callahan Piano experts worked on my piano action. They increased the hammer weight in such a way that I now have a bigger, fuller sound yet the feel is very even and under my control. "All of the guys in the shop were nice to work with and both attentive and straightforward in their comments. They all worked as fast as possible without sacrificing perfectionism, and I was without the piano for only about five weeks. "I learned a great deal about the workings of my piano throughout the entire process, as everyone was more than willing to answer my questions and engage me in discussion. I appreciated this enormously. I have to agree with your mother! " 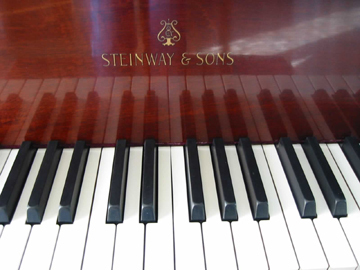 "Several years ago you did a thorough overhaul of my 1941 Steinway Model M grand. Then, about a year ago, it developed a problem rarely encountered: the hammer felt (apparently due to a bad batch of glue) began separating from the wooden hammer molding. "You could have merely re-glued the felt with some other variety of glue, which probably would have satisfied me. Instead, being the perfectionists you are, you opted to replace all of the hammers, at no cost to me. "After Michael's meticulous tuning and voicing, the piano sounds as beautiful as it did when it was purchased in 1941 in Washington D.C. for me by a loving relatives who are no longer with us, but whom I am still mentally thanking on a regular basis. I've told you this before, but it bears repeating. It is a rare privilege to deal with a business, large or small, which exhibits the integrity you have. My daughter, Dorothy Reeves, is also in your debt, for after I'm gone, she will treasure this piano as I have." It was with some fear and trepidation that I submitted my 1962 Steinway Model M to you for a complete action restoration last September. Just one year earlier, my piano technician had replaced the original hammers with new Steinway hammers, with disastrous results. After his repeated efforts, adding lacquer, then needling, then more lacquer, over and over again, I finally gave up. After all his work, the action felt like that of a truck and the sound was harsh. Needless to say, I didn’t enjoy playing the M after that. Fortunately, I subsequently heard of the Stanwood action balancing system and that your firm used the system. Based on several glowing recommendations, I decided to have you do a complete action restoration with new Renner action parts, including new Ronsen hammers custom-made with European felt and new custom-made bass strings. I can’t tell you how happy I am with the result. The action is totally even, responsive and smooth as silk. The sound is incredibly beautiful, the voicing perfect. 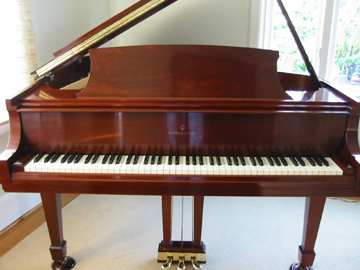 Now I’m saving my pennies in anticipation of the day when I can have you design and install the Stanwood system on my relatively new (2000) Steinway Model B (I’m a member of the Palo Alto Two-Piano club). It is a fine piano but has a fairly heavy action, nothing like the smooth, light action you gave my M. Because of the wonderful transformation you achieved on my M, I now find myself playing it almost exclusively (and it is the piano of choice with my two-piano colleagues). I’m afraid the B is feeling very neglected. Thanks again for the fabulous work. "WOW! When I first saw the 1933 Steinway B that would become mine, I was a little apprehensive. It was mostly the faith and confidence that I had in John's abilities that convinced me that it could be the piano of my dreams. Now I'm a true believer. John and the team in the workshop did an outstanding job. What a joy to sit at the piano and play! The keys are so responsive, the sound is rich and beautiful. I actually feel for the first time that I can control the sound I want. I'm even a bit piano-obsessed! I learned a lot about pianos during the process, even though for me it's only the tip of the iceberg. The excitement was contagious each time I was able to visit during the rebuilding. I have to say, not only are all the craftsmen in the shop ultra-professional in every aspect, they all truly love what they're doing and it shows. If I moved to Mars, I would have to ship the piano back here for tuning and any work. No one will ever touch the inside of my Steinway except for the team at Callahan Piano. Yes, they are nice boys too! We invite you to visit our new videos page--and hear client comments for yourself!